It must be pretty difficult being gluten intolerant, watching everyone else tuck into whatever they fancy and missing out on tasty grub all the time. Which is why I decided to restore some balance when I cooked dinner for the first time in my new weasel den. The trick was to find something everyone would enjoy, but that was also gluten free for my gluten-intolerant Mammy. I decided a chicken dish would be most likely to please everyone’s palette and picked up this nifty little recipe from BBC Good Food, which I tweaked a bit to suit my own tastes. 1.) First of all, mix the soft cheese, olives, sundried tomatoes, garlic and oregano in a bowl. 2.) Next, use a sharp knife to cut a slit along the side of each chicken breast, then stuff with the soft cheese mix. 3.) Pop on a baking tray and season the chicken. Top with sliced tomatoes, drizzle with olive oil. 4.) Roast for 20 minutes at 220C, or until the chicken is cooked through entirely. I served the Italian chicken with roast potatoes, side salad and some crusty bread, plus a bottle of my Portuguese favourite Vinho Verde. The trick with the roast potatoes is too cover in olive oil and season, then cook on a low heat for 2 hours until they are crunchy on the outside and soft in the middle. Think making a gluten-free dessert is a bit of a challenge? Try this super easy recipe for a chocolate brownie from Delicious and you’ll see how easy it is. 1.) Use the vegetable oil to grease an 18cm square cake tin. 2.) Melt the chocolate over a bowl of simmering water, stirring gently. 3.) Separate the eggs, whisking yolks and sugar until pale. 4.) Add melted chocolate, almonds, coffee and pecans and stir. 5.) Whisk the egg whites until they form peaks, then gradually add to the mixture. 6.) Pop in the oven for 18 minutes at 180C, keeping watch to make sure it doesn’t burn. 7.) Leave to cool in the tin, then cut into squares and spoon some crème fraiche and raspberries on top to serve. Let me know if you try out either of the recipes? Enjoy! 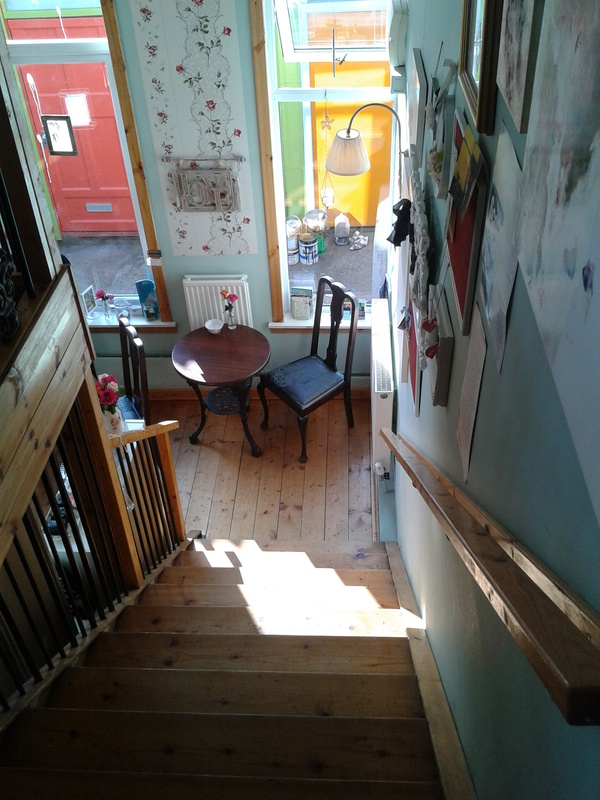 The Hidden Lane Tearoom is a wee gem of a place, indeed hidden down a secret lane off Argyle Street in Glasgow. After several hours spent harassing the general public and posing serious danger to our own lives (cocktails and Glasgow traffic do not mix) on my cousin’s hen party, we tottered down a quiet little lane to find a nest of homely, vintage loveliness awaiting our arrival. Small, but perfectly formed, every shelf and table in the Hidden Lane Tearoom is stacked with vintage crockery, quirky antiques and curios. I particularly loved the freshly cut roses on every table – so pretty. Most of the hen party went for the vintage hair and makeup makeover on offer and came out looking bloomin’ fabulous. I, however, passed on the offer – with a face as big as mine it’s far too easy to wind up looking like a drag queen – and contented myself supping champers from a teacup. Surely the crowning glory of the Hidden Lane Tearoom was the spectacular range of cakes and sandwiches. We were treated to mountains of whoopie pies, chocolate brownies, meringues, lemon cake and white chocolate pots…and every single thing I tried was utterly moreish. Perhaps to my detriment. The two very nice ladies behind the counter made me a smashing coffee, which thankfully managed to shake me from the impending sugar/champagne fuelled crash.